Good news: more orang utans in Borneo. In Constantinople, in the time of Justinian, gangs used to fight in the streets. Nominally linked to chariot teams at the hippodrome, the Blues fought the Greens in a daily Old Firm derby. Aspirant politicians were connected to both mobs, and once they combined to try to bring down the Emperor. In Thailand, the reds have been fighting the yellows, and now the mysterious blues have turned up. The PM has declared a state of emergency. It’s business as usual, then. 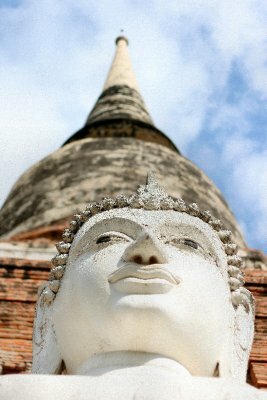 Tradition has it that Ayutthaya was founded in 1351 by U Thong. In fact there was already a town called Ayodhya on the east bank of the river, where the oldest wats are to be found. But when his town, Lopburi, was hit by an outbreak of smallpox, U Thong founded the new town in a strategic location entirely surrounded by three rivers. 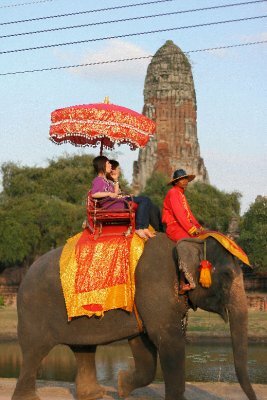 Ayutthaya is no mere eyot: the island, which is very nearly square, must be two miles across. Canals used to run through it. By Thai standards Ayutthaya is a fairly new town. Indeed ‘New Town’, Chiang Mai, is older, being founded in the thirteenth century. 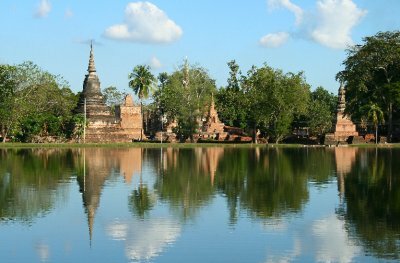 Sukhothai dates from the twelfth century, Nakhon Si Thammarat from the eleventh, Nakhon Pathom from the sixth, U Thong from the third. King Ramathibodi (or maybe Boromoratcha II) II of Ayutthaya captured Angkor in 1432, at which point it was the dominant power in the entire region. (Alliances, as always, were cemented by marriage. Ramathibodi was the son-in-law of the Emperor of China.) Six years later Ayutthaya finally acquired Sukhothai, and thereafter concentrated its energies in the Malay peninsula, where it constantly tried but failed to take Melaka. The Portuguese got there first. 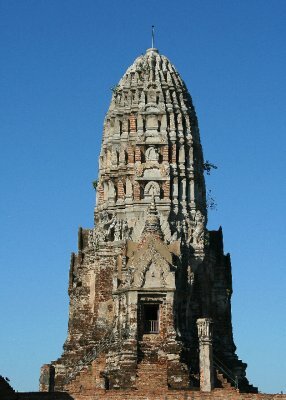 Ayutthaya became the capital of Siam in the fifteenth century, and remained so until sacked by the Burmese army in 1767. At the centre it was a strong and centralised state, where the king possessed absolute power. He was much more remote than the kings of Sukhothai, and he was, of course, a devaraja, and an incarnation of Vishnu. There was no law of succession - there still isn’t – and so civil wars were very common. 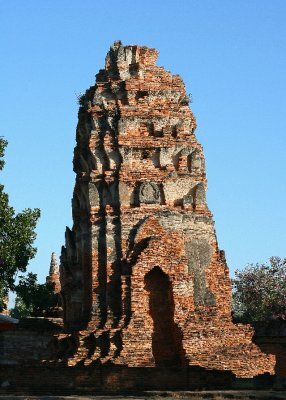 There were 33 kings of Ayutthaya between 1351 and 1767, belonging to several dynasties. Ayutthaya controlled dependencies all over Siam. From the north came hard wood, sappanwood, eaglewood, molasses, iron, hide, rhinoceros horn. From the south came spices, pepper, tin, gold, seafood, salt and jaggery. From the east coast came spices, pepper and gems, from the northeast forest products, silk, cotton and tin, and from the west tin, spices and pepper. From the delta of the Chao Praya came fish, rice and fruit. 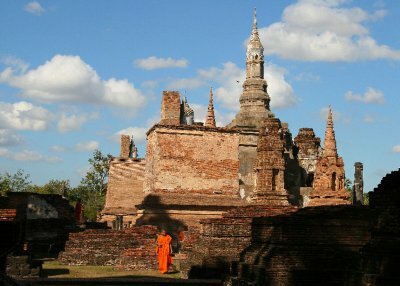 From the sixteenth century Ayutthaya constantly came under threat from the expanding Burmese kingdom, which expanded into Chiang Mai and Laos. In 1569 Ayutthaya was taken, and Ayutthaya became a vassal state of Burma, a Pétain being installed on the throne. This state of affairs did not last very long, though, as one of the princely hostages taken back to Burma organised military resistance upon his return to Ayutthaya. This was King Naresuan the Great. The Burmese army marched to Ayutthaya and fought the Ayutthayan army at Nong Sarai. Naresuan defeated and killed the Burmese crown prince, Maha Uparaja, in a duel on elephantback. Like jousting, or man-to-man challenges in Greek and Roman times, this was the honourable/chivalrous way of going about a fight. Elephants were used as war machines and as pack animals. 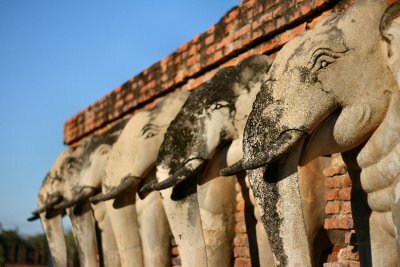 A hundred and fifty elephants are still kept in the kraal in Ayutthaya. In the late afternoons you see them, dressed up, carrying tourists around town. I had had enough of elephant rides by then. 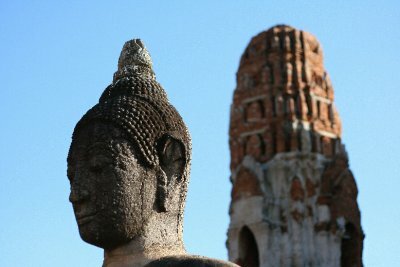 Ayutthaya became a great centre of international trade. Ayutthaya traded with China, Japan, Champa, Melaka, Java, Annam, Persia and Mocha in Yemen. Each nationality had its own enclave there were, at least, Chinese, Cochins, Malays, Makassarese, Japanese, Chams, Mon and Khmer. Indians came to sell textiles and to buy elephants, ivory and tin. The Portuguese arrived in 1511, fresh from taking Melaka. They were granted permission to trade in 1516. The Dutch received permission to trade in 1592. The newly-founded VOC arrived in 1604. They found a thriving port city with goods for sale from all over Asia. They were looking for a water passage to China, but stayed on to trade. The VOC established a factory there, where they bought hides, sappanwood, tin and pepper. 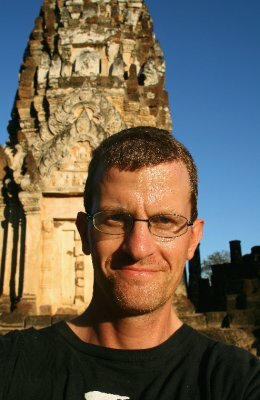 Jerome van Vliet, head of the VOC factory, wrote an account of the usurpation of the throne by Prasat Thong in 1629. Other Europeans also began to arrive in the 17th century. King Narai allowed many countries to establish factories at Ayutthaya. Bizarrely, his foreign minister was a Greek, Constantine Phaulkon. After 1664 Narai decided he no longer wished to rely too much on the violent Dutch, and he turned to France. He allowed French missionaries in, to run hospitals and schools. Envoys from Louis XIV arrived at the court of King Narai in 1685; there is a picture of the event at the Grand Palace in Bangkok. Narai sent an envoy back, and Kosa Pan was received by Louis XIV at Versailles in 1686. The English East India Company maintained factories here from 1612-23 and 1675-89. All the foreigners had enclaves because they came to trade but had to wait for the monsoon. Each settlement had its own kapitan, who handled judicial matters. The foreigners were free to keep their own religious laws and customs. Golden times. In 1765, however, Burmese armies invaded Siam. In 1767 they besieged Ayutthaya, which capitulated in 1767. It was looted and burned, and its priceless libraries, artworks and archives destroyed. That was the end of it. When Taksin got Siam back together, he built a new capital south of Ayutthaya at Thonburi. On the east side of the river, the Wat Yai Chai Mongkol (or Mongkhon) was founded by U Thong, the first king of Ayutthaya, in 1357 and enlarged by King Naresuan in 1592. In 1766 Ayutthaya was sacked by the Burmese army. 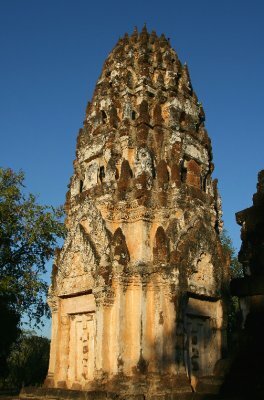 The wat was destroyed and abandoned, and only re-established in 1957. The wat was rebuilt on a smaller scale in 1979. It is surrounded by Buddhas in the defeating Mara position. 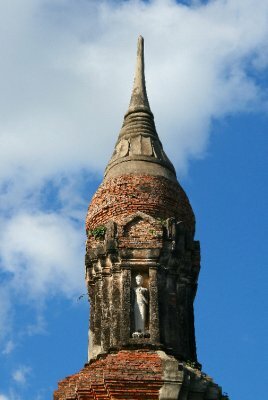 The huge chedi was built by King Naresuan in the sixteenth century to commemorate his victory against the Burmese in 1592. The Wat Phanang Choen is a Chinese-Buddhist temple, and much-used. It is easy to tell the difference: there is Chinese lettering everywhere; a lot of red; lots of subsidiary shrines within the building; no space; and people stick gold-leaf sheets on to all the statues. These are offerings to Ganesh. The main image is a very large Buddha. 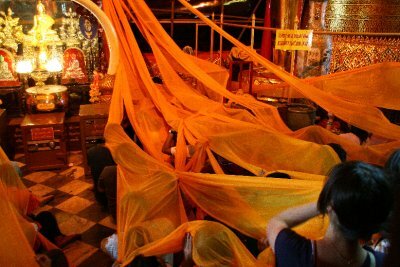 As I arrived an enormous orange cloth was unravelled to cover the heads of the congregation. Dunno why. The wat is on the bank of the river, and you can walk down to a jetty and buy food to feed the catfish. 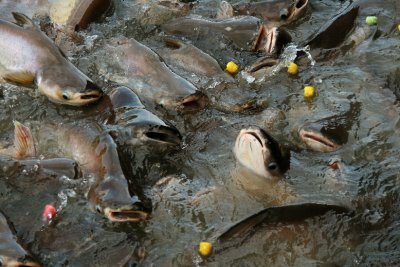 They hang around in such large numbers that they make the river boil. Wat Na Phra Mane was built in 1499 AD - by Indra, apparently. It hosted a peace conference between Siam and Burma in 1569. 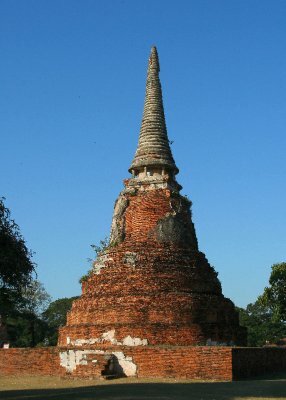 In 1760 the Burmese King Alongphaya, then attacking Ayutthaya, fired a cannon from the wat at Ayutthaya. It exploded, and the king was seriously injured and died on the way back home. 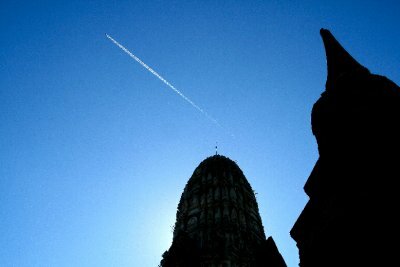 So it’s a place with patriotic overtones and the Buddha image within is believed to have saved Ayutthaya; it takes a negligible stimulus to produce a patriotic response in your average Thai person. 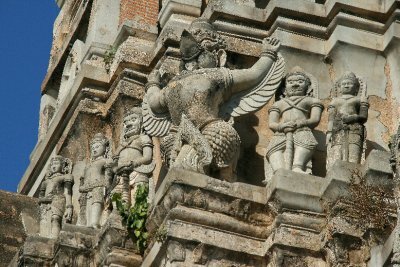 In the gable at the front is a teak carving of Narai riding on a garuda, stepping on Naga’s head. 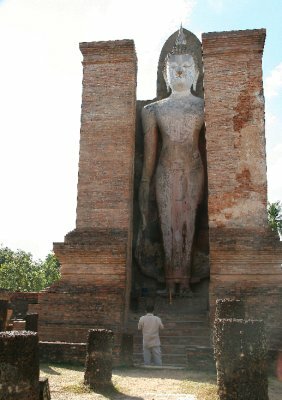 The Buddha inside is 6.60m high, in early Ayutthaya style. 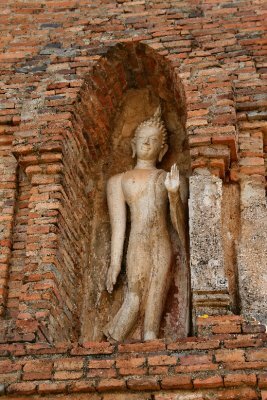 In Ayutthayan style, the Buddha is relatively slim with a V-shaped torso and figure-hugging Batman robes. 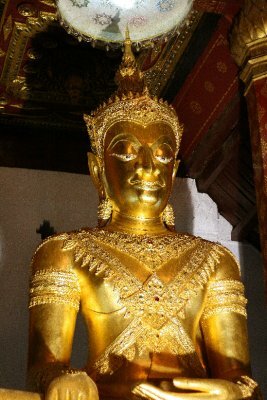 Buddha may have renounced his wealth, but he was a prince, and Ayutthayan Buddhas are often dressed royally and crowned; the kings of Ayutthaya liked to emphasise the power of the monarch. Next door, in the viharn noi, is a nice Dvaravati Buddha from maybe the sixth century AD. 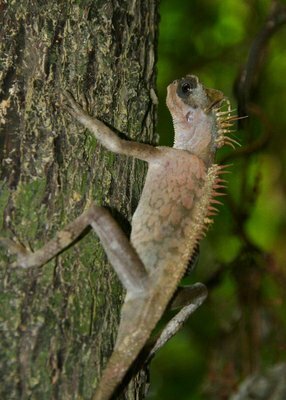 It is held to have come from Sri Lanka. 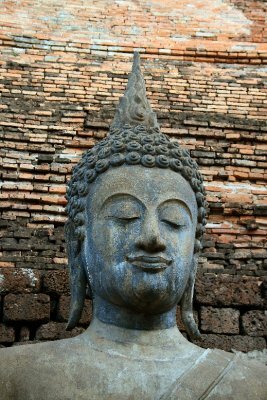 Buddhism arrived in Thailand by the second to third centuries AD at the latest. In central Thailand there was a kingdom known as Dvaravati (from Sanskrit), which flourished in the sixth and seventh centuries. The artistic style known as Dvaravati was employed throughout Thailand between the sixth and eleventh centuries. Quite a few stucco-covered stupas date from this era. In the Dvaravati era there were also a lot of images of Avalokitesvara, lord of the six syllables: om mani padme hum. There was a Wat Maha That in every provincial city. It always contains a stupa with a Buddha relic in it, and is the most sacred place in town. In Ayutthaya the relics appeared miraculously, just when they were needed. Royal ceremonies were held there and it was considered the centre of the city. In Ayutthaya the presiding stupa was a Khmer-style prang, but there are chedis and prangs all over the place; it is a large site. Most of the chedis are reduced to brick, but you can see that they used to be covered in stucco. The wat was founded under the third king of Ayutthaya, Borromaratchathirat I (phew), in 1374, and completed under Naresuan, who reigned 1388-95. 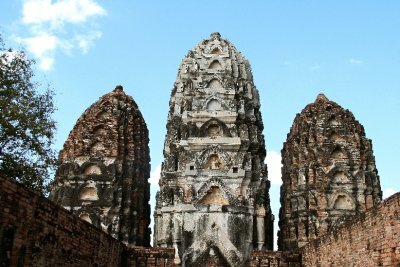 It was originally 44 metres high, but collapsed during the reign of Songtham (1610-28). It was renovated in 1633, after which it was 50 metres high. It was badly damaged in 1767, and the wat destroyed, and the prang collapsed again during the reign of Rama V in 1911. It feels a bit like Pompeii. Subsidiary prangs lean at angles. 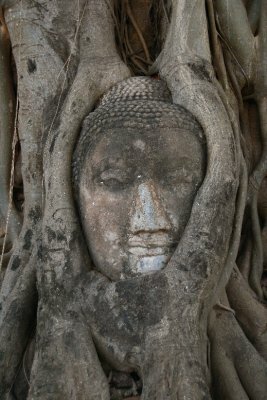 It is in the grounds of the Maha That that the iconic image of Ayutthaya is found: the Buddha head in the bodhi roots. 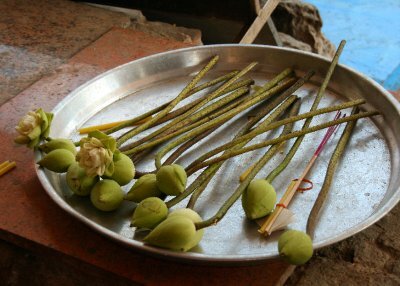 The bodhi tree has grown around the head so that now it is incorporated into the tree. The Fine Arts Department excavated only in 1956. 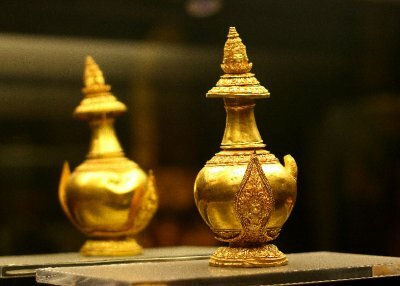 Six nested stupa-shaped reliquaries were found buried 17 metres under the prang. The actual Buddha relic is perhaps a third the size of a grain of rice. With the reliquaries was a lot of treasure, among which was a gilded stone container in the shape of a fish, inside which were 19 beautiful gold offerings. There were also images made of gold, silver, bronze and tin. Votive tablets were found, too, made of tin, clay, and gold and silver foil, all dating from the thirteenth and fourteenth centuries. They are now in the museum in Ayutthaya, and naturally the relics are part of a shrine. While I was looking at the objects I was given a banana by the museum staff. 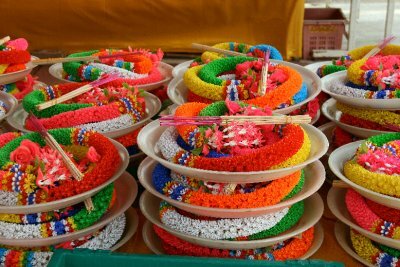 This had been part of the offering to Buddha earlier in the day, and I was told it would bring health if I ate it. All the staff were eating bananas. Maha That was the first place in the country that Buddha relics and treasure had been unearthed, and this sparked a wave of chedi robberies. The crypt of Wat Ratchaburana was robbed in September 1957. 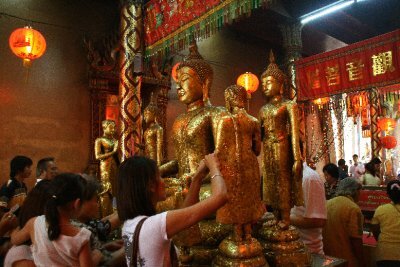 Inside the crypt was a gold prang, originally a metre high, which may have contained a Buddha relic. The robbers had torn it apart to make it easier to transport. The robbers were arrested but only a few pieces were recovered. It was only then that the Fine Arts Department was instructed to excavate the crypt. Also in the crypt were Buddha images in Pala, Dvaravati, Sriwijaya, Lopburi, Sukhothai, U Thong and early Ayutthaya styles, which is pretty much all of them. There was also a set of royal utensils (jars, trays, boxes etc) including betel nut set, and a water pot with a lid topped with the faces of Brahma; and jewellery. These are also beautiful objects. Gold objects were inscribed variously with Thai, Khmer, Chinese and Arabic scripts. Royal regalia were also found. Five items symbolised kingship: crown, sword, walking stick, fly whisk and slipper. The sword was found. The wat was founded in 1424. On the site itself there are two newer chedis. Boromaratcha II built the chedis to commemorate his brothers, who had managed to kill each other in a duel on elephantback. The site was badly damaged in 1767 but the prang is in perfect condition, decorated with garudas, nagas etc. You can go down to see the crypt, which was decorated in a dark red mural. The Wat Phra Mongkhon Baphit houses a huge Buddha, 12.45 metres tall, in bronze. 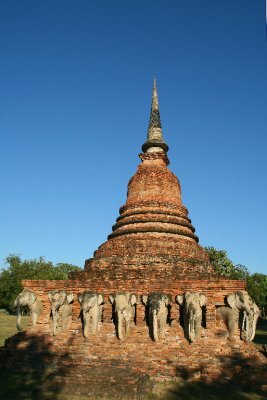 It is also in early Ayutthaya style. Its head and right arm were broken during the catastrophe of 1767. The viharn was restored in 1956, and it still looks very new. At the centre of Ayutthaya, the Grand Palace was a gargantuan complex. Three concentric walls surrounded the king’s residence. There was an administrative and ceremonial area in the middle part, and Wat Phra Si Sanphet, the royal wat, stood in the outer layer. Almost nothing now remains. It housed the Phra Si Sanphet, the largest standing metal Buddha ever known. 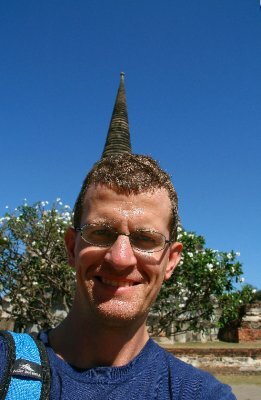 Now the Wat Phra Si Sanphet contains three chedis in a line. They were built to house the remains of three Ayutthayan kings. It was at Si Sanphet that I finally received my own usnisha. 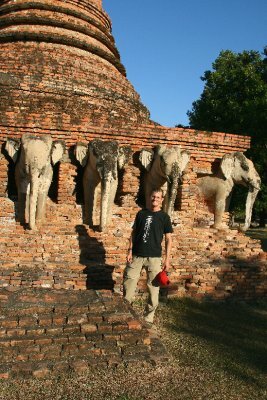 In three days in Ayutthaya and Sukhothai I visited twenty-odd wats and three museums. Both are UNESCO World Heritage Sites. Ayutthaya is nearer Bangkok (80 km or so north; two hours by commuter train; 15 baht) and I visited it first, but I’ll mention Sukhothai first because its golden age preceded that of Ayutthaya. Sukhothai is a long way further north of Ayutthaya, at 17º N 100º E.
In the ninth and tenth centuries the Khmer kingdom, which took over the area now corresponding to Cambodia in the first half of the ninth century, pushed into Vietnam, Laos, China and northeast Thailand. Their culture was Hindu, although the Khmer leaders converted to Mahayana Buddhism in the late twelfth century. 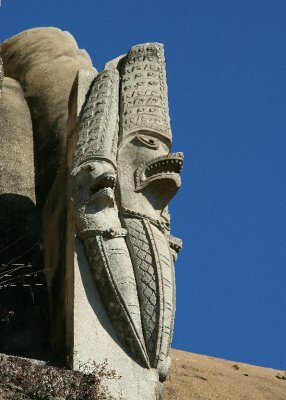 Their religious architecture therefore includes the usual Hindu pantheon, particularly Shiva and Vishnu. Like the Chams in Vietnam, they often worshipped Shiva in his impersonal form as a linga. The most notable architectural style is the prang, a tower shaped like a cob of corn. Again like the Chams, and like the later kings of Ayutthaya, the king was a remote, all-powerful devaraja, a god-king, a living embodiment of Shiva. During the period when northeast Thailand was within the mandala of Angkor, ethnic Tais pushed down in large numbers from southern China into what are now Thailand and Laos. The land became known as ‘Syam’. Jayavarman VII reigned from 1181 to 1219, and he spent so much on temples and monks that the economy “overreached itself” (I’m not sure what this means exactly; it wouldn’t have been a property bubble, since these wats would not have been traded. There was cash money, but the economy was not highly monetised. More likely, therefore, that the state’s use of the main factor of production – by corvée - crowded out other activities, particularly those that required a food surplus, such as military defence). Shortly afterwards the empire began to fall apart. The collapse was finally provoked by the invasion by Kublai Khan’s Mongol hordes between 1215 and 1250. The fact that there was bubonic plague at the time may also have contributed, as it did to the decline of the Roman Empire – for which see the entertaining Justinian’s Flea. The Mongol invasion also forced the Thais to unite among themselves to face the threat. At this time Sukhothai, which is now in the middle of Thailand, was the main Khmer outpost in the region. Two Thai princes joined up to force the weakened Khmers out of Sukhothai. One of the princes became king Intradit and founded a dynasty known as Phra Ruang. At first it was as local as the Capet kingdom in the Île de France, but it expanded under the reign of Intradit’s youngest son, Ramkhamhaeng, ‘Rama the bold’. Ramkhamhaeng expanded south along the Chao Praya valley and, mainly by marrying his children wisely, gained supremacy over most of Thailand, and parts of Laos and Burma. Several momentous events occurred in the reign of Ramkhamhaeng. The earliest example of Thai script is on a stone from Sukhothai dating from 1292. In it Ramkhamhaeng records how he came to the throne, what a wonderful ruler he is and what he has done. “Sukhothai is ranked in the top six places in the world for ease of doing business”, he says. "The green goods sector is the sixth largest in the world. We have one of the lowest rates of work-related deaths and injuries in the known world." Or something. He also records that in 1283 he invented a script for the Thai language. This was not the first writing to be used in Thailand, as Pallava script is found from the seventh to the ninth centuries, Khmer script from the tenth to the sixteenth centuries, and Mon from the eleventh century to the present day. But it was the first Thai writing, Lai Sue Thai, and in 1992 its 700th anniversary was celebrated with great ceremony. The early Sukhothai script had 39 consonants, 20 vowels and two accent signs. Unlike Pallava and Khmer, and modern Thai, the vowels were incorporated into the main line of consonants, rather than floating over or under. The letters and words are therefore easier to distinguish than in modern Thai, which has 44 consonants, 26 vowels and four accent signs. The Sukhothai stone is so important that it is on the UNESCO Memory of the World Register, whatever that is. 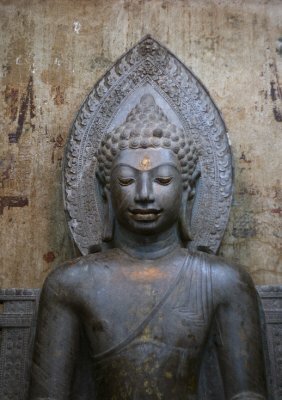 Ramkhamhaeng also started building temples, and he espoused Theravada Buddhism instead of the Mahayana Buddhism then practised by the Khmer leaders. 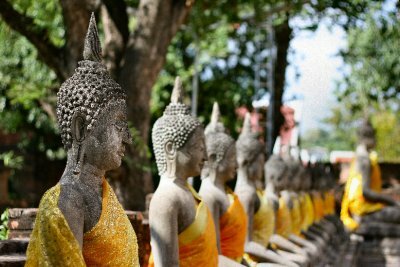 Ninety per cent of the population of Thailand are now Theravada Buddhists. 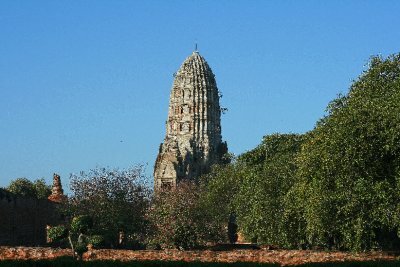 In 1284 he ordered the building of a chedi at Si Satchanala. The wats at Lopburi, Sukhothai and Si Satchanala date from this time until the fifteenth century. 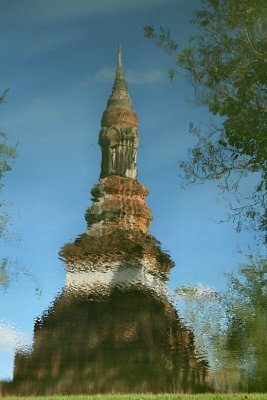 Sukhothai – and therefore Thai - Buddhism is syncretic. It encompasses large parts of Hinduism. So not only were the Khmer temples in Sukhothai converted to Buddhist use, but the Hindu icons remained. Even now, Thais worship Hindu gods, especially Vishnu (including his seventh incarnation, Rama), Shiva and Ganesh; the Ramayana was reworked into the Ramakien, as I have mentioned before; and garudas and nagas are seen all over temples in Thailand. Ramkhamhaeng possessed great influence, but the alliance fell apart soon after his death, and by 1320 Sukhothai was back to being a merely local kingdom. It became a mere province of the kingdom of Ayutthaya in 1438, six years after Ayutthaya had captured Angkor. After the Burmese invasion of 1766-7 Sukhothai was abandoned, and the local administrative centre moved at some unknown date to a new town 12 km to the east, known, confusingly, as Sukhothai. That is where most of the tourists stay and it is a nice place, full of Italian tourists. 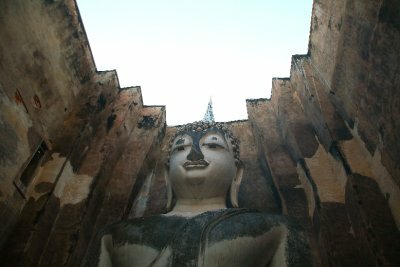 Sukhothai also gives its name to an architectural and artistic style. 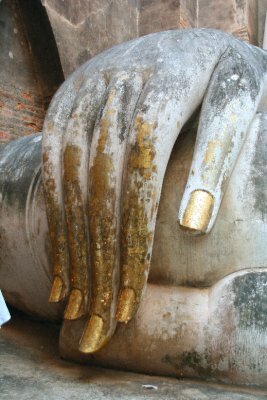 Sukhothai Buddhas have oval, androgynous faces, relatively slim bodies and long fingers - about four feet long in this case. His robes cling diaphanously. And the Buddha has a serene, not to say positively happy, expression. The Buddha may have achieved absolute renunciation of earthly desires, but he seems to be chuffed to bits about it. Before the development of figurative images of the Buddha, in the early centuries of the common era, the Buddha was indicated by symbols: the Dhammachakra (Wheel of Law), umbrellas and footprints. The Buddha’s footprint, the Buddhapada, is found in India and Sri Lanka from the second century BC, and the tradition of footprints began in Thailand by the seventh century AD. 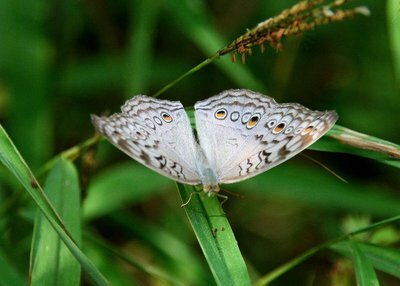 There are quite a few around Sukhothai. Here is one at Wat Tra Phang Thong, which dates from 1359 AD. Although seated Buddha images are more common, the image for which Sukhothai is known the walking Buddha in the round, which depicts the Buddha returning from preaching to his mother in Tāvatiṃsa heaven. He has one foot forward and one hand raised in the policeman’s ‘stop’ position. These Buddhas are known from the 13th/14th centuries onwards. 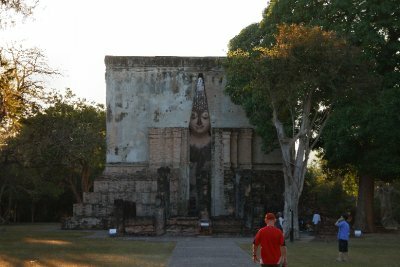 In a day in Sukhothai I rented a bike and visited eight wats and two museums. Within the precincts of the town is the Heritage Site, which has been extensively reconstructed. Much of the restored Sukothai is on the water, and there are bright flowers everywhere: it is reminiscent of Augusta National, and indeed it could be a grand golf course, but for all the temples. Wat Phra Mahathat is a wonderful, very extensive site. It was the royal temple of Sukhothai, and it grew to be so big that it had one bot, ten viharns, eight mondops and over 200 chedis. All of these were made of red brick or laterite, and covered in stucco. 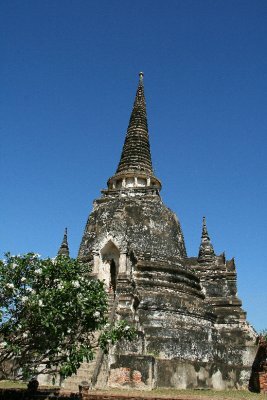 At the centre, and still-standing, is a late Sukhothai innovation, the lotus-bud chedi. On each side of the main chedi are two very large walking Buddhas. Also visiting the wat was a party of a hundred monks from Sri Lanka. 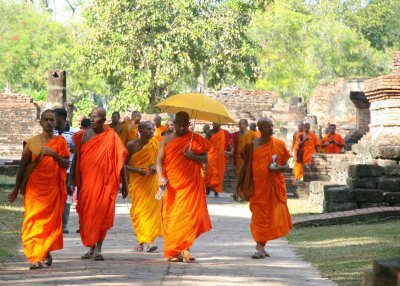 Thailand got much of its Theravada tradition and practice from Sri Lanka, and the religious links are close. 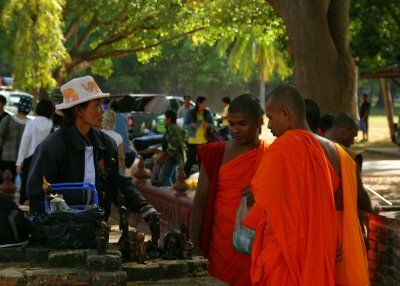 The monks were toting cameras and buying souvenirs like any other tourist. They were due to go to Bangkok for a ceremony at the royal palace over New Year. I chatted to one of them – it was nice to meet a Buddhist monk who could speak English fluently – and he gave me his card and we agreed to go and watch some cricket in Colombo one day. Wat Si Sawai dates originally from the twelfth centuries, predating the Sukhothai kingdom. 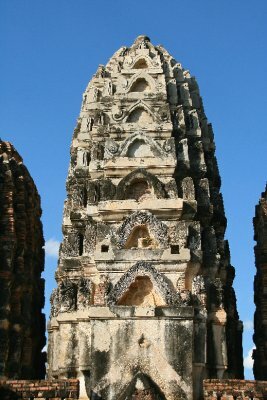 It has three Khmer prangs built in Lopburi style, with low bases and decorated with stucco, decorated with nagas and garudas. The prangs are made of brick with stucco, and the pillars are of laterite. There were images of Hari-Hara (a combination of Vishnu and Shiva) and of Vishnu as a linga. The later Buddhists simply built a viharn next to the prangs and turned it into a Buddhist temple. Little remains of the viharn. Wat Traphang Ngoen is another lotus bud chedi, with four niches for Buddhas. There is a viharn, and a nearby bot surrounded by water. 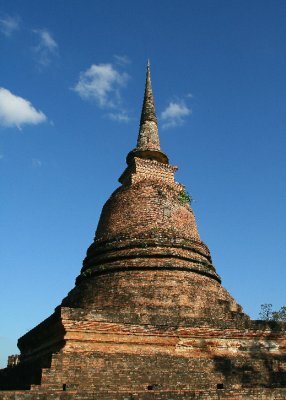 Wat Sa Si is a brick bell-shaped chedi in Sri Lankan style. 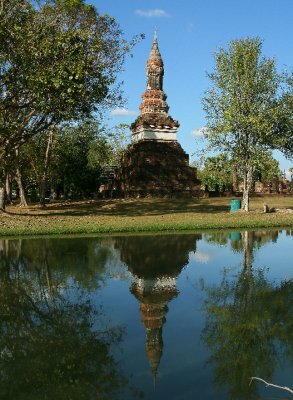 Wat Sorasak is a heavily restored bell-shaped chedi. Its base is surrounded by elephant buttresses. 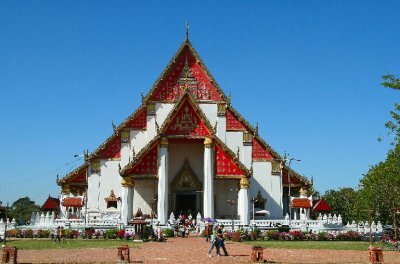 Wat Phra Phai Luang was, like Wat Si Sawai, a thirteenth-century Hindu prasad later converted into a Buddhist temple. It was probably the centre of the old Khmer town. Again there used to be three prangs, of which only one remains. At Wat Si Chum an enormous square mandapa almost entirely surrounds a large seated Buddha, again in smiley Sukhothai style, late thirteenth century. The mandapa has a staircase, which allows one to climb to the level of the Buddha’s face. In principle the staircase could be used to project a voice from the level of the Buddha’s head down to worshippers below. Indeed, there is a tradition that this Buddha speaks to certain privileged people. One of the kings of Ayutthaya, King Naresuan, assembled his troops here before marching on Sawankhalok in the mid-fifteenth century, and he probably got the Buddha to do his talking. Ovid yearned for an end to his exile, which may have been provoked by his Clintonian inability to keep it in his trousers. I don't feel the same way, but I am returning home anyway at short notice for a job interview. I'll probably continue to blog a little bit, since I have written little or nothing about Biak, the Papua trip, Bali, Ayutthaya, Sukhothai, Tana Toraja or the Moluccas. How many seas and oceans have I seen, o Muse? The South China Sea, Gulf of Thailand, Melaka Straits, Sulu Sea, Celebes Sea, Java Sea, Flores Sea, Pacific Ocean, Indian Ocean, Banda Sea and Andaman Sea. Possibly more. Distance travelled since arriving in Bangkok: 39, 387 km. That is measuring point to point, and is an underestimate. It is approximately the circumference of the Earth, and more than Wallace travelled in eight years in the region. But his journeys were hard. Most internet connections: Vietnam and Singapore. Fewest: Indonesia. Locations dived, thirteen in four countries: Nha Trang, Ko Pha Ngan, Sipadan, Redang, Perhentians, Tulamben, Gili Lembongan, the Gilis, Komodo, Bunaken, Lembeh Straits, Ambon, Similan. That is quite a list. None of these was a bad place to dive. The best reef dive sites were Sipadan (turtles, sharks, barracuda) and Komodo (large rays and giant trevally). Most honourable mentions: Bunaken; Pulau Tiga, Ambon; Similans; the Perhentians and Redang. The best muck dive sites were Lembeh Straits and Ambon Bay. Places where I swam: 27. Take-offs and landings: 31. Flights with Air Asia, 12. As I may have said before, Air Asia is like Ryan Air, except without the psychopathic attitude. A company partly owned by Air Asia and partly by Richard Branson is to open a route between Kuala Lumpur and Stansted on March 11. Tickets for economy seats start at £99. Hopefully it will introduce greater competition into the market for flights between Europe and Southeast Asia. -	Trains that cost 30p for a two hour journey; buses that cost £1 for a five hour trip. -	Cheap motorbike taxis. They should have them in London. -	Nam pla, belacan, sambal, tom yum, roti canai, ga xao sa ơt, beef rendang, Penang curry, dried broad beans, fried rice, bananas with coconut cream, rice with every meal, and a lot more. -	The process of getting from A to B. -	The Economist every week. 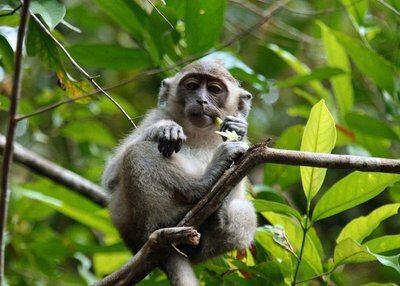 Not visiting Sarawak; Ternate and Tidore; the Kai islands; Sumatra; southern Laos; Alor; northeastern Thailand; the national parks east of Bandung. Not finding the time to return to Luang Prabang. Not climbing Fansipan or the peak of Rinjani. Not seeing Mt Merapi, near Solo. Not getting to order spider or dog. Not seeing mola mola in Nusa Lembongan. Too many temples; not enough national parks. 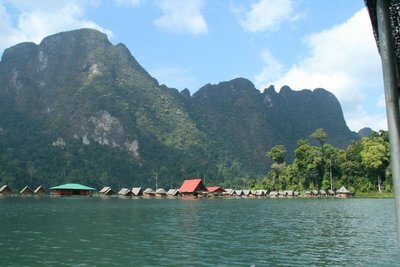 In Khao Sok National Park I oscillate in a string-vest hammock, assaulted by the shrieking of cicadas. Butterflies small, large and immense dart about in the garden in front of me, and within fifty yards there are probably a hundred species of plant. It’s a good spot from which to contemplate the diversity of life, and one of the men who explained it. The four In Our Time programmes on Darwin (Radio 4 podcasts) are first-rate broadcasting. 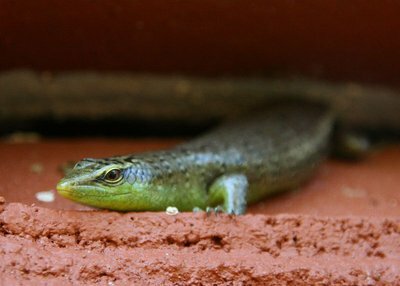 Here is a lizard that lived in and around my bathroom. The first thing to do in the park was a night walk in the jungle. I am by now no virgin noctambulist and I know that night walks are hot, sticky, and somewhat stressful. You can’t see much, the noises are loud, and things with too many legs land on you. 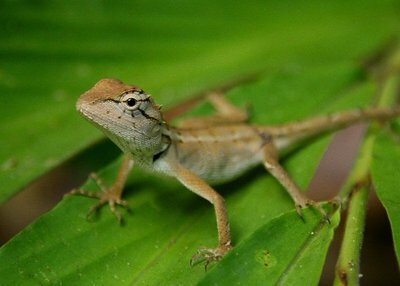 (The noise is mainly the susurration of insects, the bark of frogs and the hoots of owls.) Sometimes you see nothing all walk. On this occasion I walked with Nit, who used to be a hunter of tigers and elephants, but became a guide 13 years ago and much prefers his new job. We were relatively fortunate, I suppose. Nit showed me discarded carapaces of cicadas, several spiders, a huge moth, and two mouse deer. Their eyes reflected grey-green in the torchlight, and their bodies appeared grey and very small. They didn’t seem too concerned by the torchlight. Mouse deer are even-toed ungulates, in the same sub-order as deer, giraffes, cattle, goats, sheep and antelope; but in a different infraorder from all of these. Their stomachs have only three chambers. I did not see: gaur, benteng, clouded leopard, tapir, civet. Few people see any of these except the last. The following day I joined an organised trip to Lake Rajaprapa, which was created three decades ago by a dam. Over a hundred new islands were created, and many animals were literally isolated. A rescue operation was mounted at a cost of 1.8 million baht, and 1,346 animals were saved. Most, I imagine, died shortly thereafter, stressed by their capture and homeless. The lake is big – about 165 square kilometres – and highly fractal, so it would be easy to get lost. 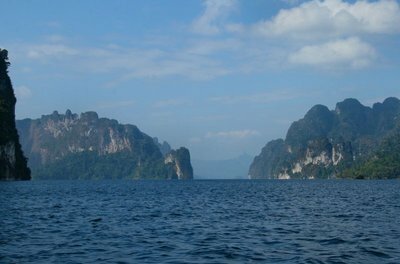 The lake is fringed and penetrated by unreal Leonardoeque molars and incisors, much like Hạ Long Bay and the area around Ninh Bình. There were about ten of us from the UK and Australia. We took a longtail boat for about an hour to a floating guesthouse. I paddled for an hour in a tubby canoe and eventually came across some monkeys. 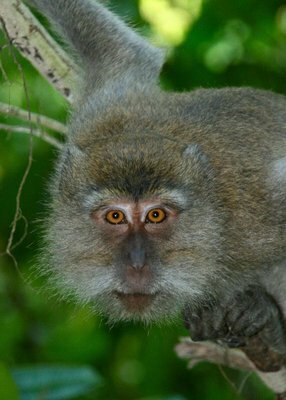 In shape they closely resembled proboscis monkeys, with pot-bellied bodies and long, thick grey tails. Their backs were black and their bellies light grey. They were dusky langurs. I could not get a decent photo. The view from the canoe. 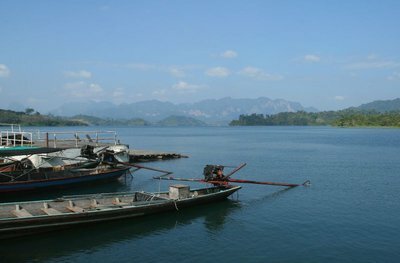 We ate a grand lunch of river fish and various curries, and then took another longtail boat to another part of the lake. We walked for half an hour and saw two chameleons. 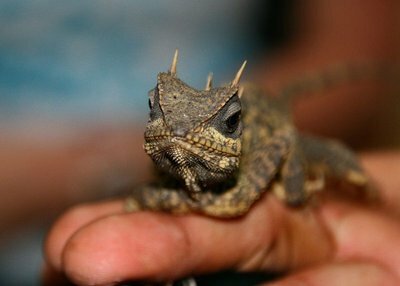 The guide, Dicky, managed to get hold of one, but it escaped while being transferred between custodians. Then we took a bamboo raft to a large cave with stalagmites and stalactites. I’ve seen too many caves. It is a general problem, which afflicts all long-term travellers. You’ve seen something like it before, so you are inevitably less impressed. The same is true for temples, jungles, diving - everything, except perhaps food. The only cure is not to travel - which is worse than the disease. Two nights ago I dined on orchid tempura; yesterday lunchtime on salad, made with the furled heads of young ferns. (A furled fern head is a crozier, which I think is a wonderful description.) A Thai salad has only two essential ingredients: lime juice and chilli, and huge quantities of both, so that to call the Thai salad hot and sour is like calling Pele a bit good. You very often encounter some combination of green papaya, cashews, coriander, celery stalks, onion, garlic, shallots and green beans, but anything goes. 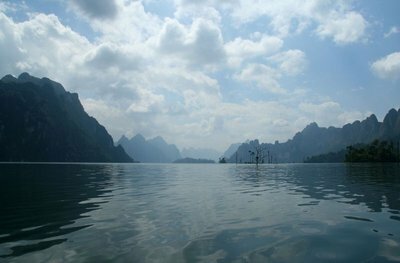 On the final day at Khao Sok I went for a stroll. I believe that the only way to walk around a jungle, unless someone is shooting at you, is alone or in a group of two. A guide is mildly useful for showing you elephant tracks and telling you stories about how local people use the palms to make alcohol or obtain resin from certain dipterocarps, and extremely useful for ensuring that you do not get lost. But I think I see more animals on my own. I walk quietly, stop frequently to look or listen, and cover two km or less in an hour. 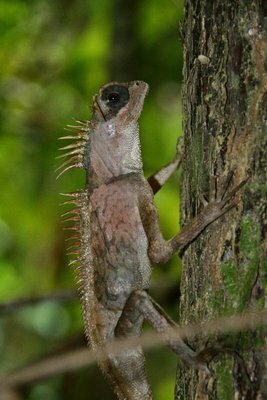 Among other things I saw a few more chameleons. One was eating a bug, very slowly, as if under doctor's orders to chew 32 times. 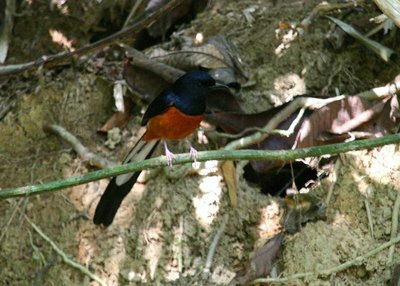 Among the many birds was a largish bird with a long tail, an orange-red breast and navy blue head and wings. 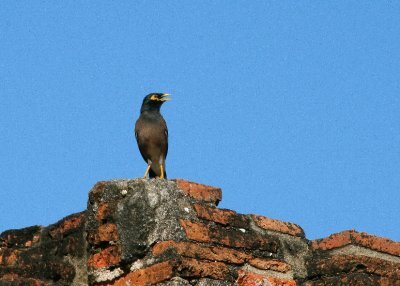 It had a beautiful, babbling, varied song. Beside the paths were large tornado-shaped webs. 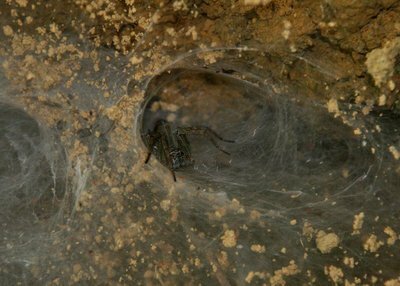 A fanged spider lurked low-slung just inside each funnel, waiting to envenom trespassers. 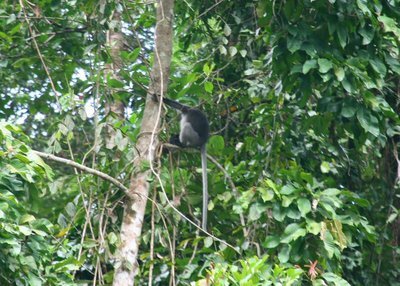 I saw two troupes of long-tailed macaques. The second was not at all shy. Twin babies play-fought. Harold Wilson smoked his pipe. A mutton-chopped adult showed a disturbing obsession with my camera. As I came back along the path, most of the family were on the ground. 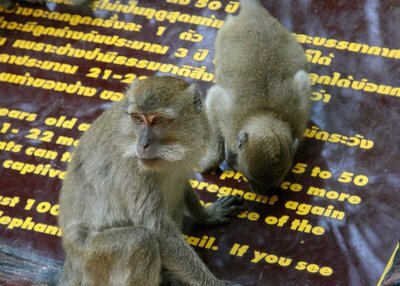 Three of them crouched on one of the information signs, apparently in submission to the only God (and perhaps there is a gibbon God and a langur Lord). They were hoovering insects. My expenditure has crept up in the last few weeks, and I think this is natural. Most people have a blowout at the end of the holiday. 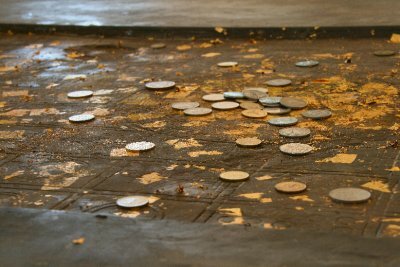 This raises the old question: what is money worth at the moment? If I go back six weeks early, I have six weeks more money to spend, right? Wrong: those six weeks don’t disappear; they will probably be spent in London, which is more expensive. That suggests spending less out here. But the determining factor is when I get a job. If I get a job earlier because I returned earlier, I have more money to spend. Trouble is, I don’t know. Anyway, I feel like spending a little more money. Before diving I stayed at a fairly posh resort in Khao Lak. My room cost a third of the bungalows, and I still got to experience the manicured lawns. The food in Khao Lak is poor, although you can probably get a decent Hahn mit Knoblauch. Proper Thai food is a balance between sweet, spicy, salt and sour. Usually you find four pots of sauces and sugar at the table, so that you can adjust this balance. Not here. Nor in the centre of Chiang Mai. And there is little spice. I suppose this is because Germans do not have the constant exposure to chilli that we do in Britain and so do not acquire the taste for it. (I should emphasise that this is an observation, not a criticism.) Actually, the Thai restaurants in Britain are remarkably authentic, down to the bitter little pea aubergines in the curry, something that is not true of Indian and Chinese restaurants. Khao Lak was hit very hard by the tsunami of Boxing Day 2004. Four thousand people died or disappeared in Khao Lak alone. The main drag is on the main coastal road north, well above the sea, but there is a road right by the coast, and the wave was five metres high when it swept over the road. That road is well above the beach; the tsunami was 11 m high. All the buildings on the coast were destroyed, of course, so nothing by the beach is more than four years old. But there are a lot of buildings; you can’t see any evidence of damage at all and the tourists are back in swarms. Now there are tsunami warning signs everywhere: "you are now in a tsunami danger zone". There are also tsunami evacuation paths, also known as roads. I walked up one, and it terminated in a padlocked gate. So much for that. On my penultimate dive yesterday I saw three octopuses. One was walking slowly, backwards, and darkened itself and forced itself into a tiny niche when I got too close (they have no skeletons). The other two looked like a single one. At first I saw the limbs, and each limb seemed to be wrapped around another, as if the cephalopod had severe pruritis. 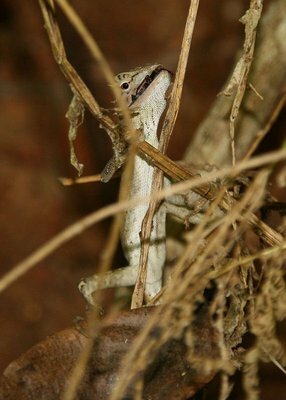 Then I saw a head peering out of a hole eighteen inches way. Gradually the limbs resolved themselves into two octopuses (or octopodes), one trying to escape. The octopus whose head was visible had its tentacles wrapped around the escapee. It looked like a case of unwilling mating. The clingy octopus was coloured dark fox; the other a sickly pale celadon.